You are here: Home / Blog / Skin Cancer / What is Basal Cell Carcinoma? 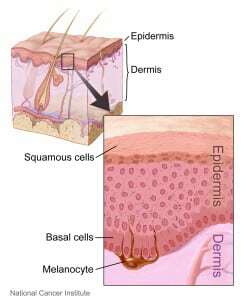 Skin Cancer 101: What is Basal Cell Carcinoma? Basal cell carcinomas are cancerous lesions or tumors that are made up of damaged or mutated basal cells. 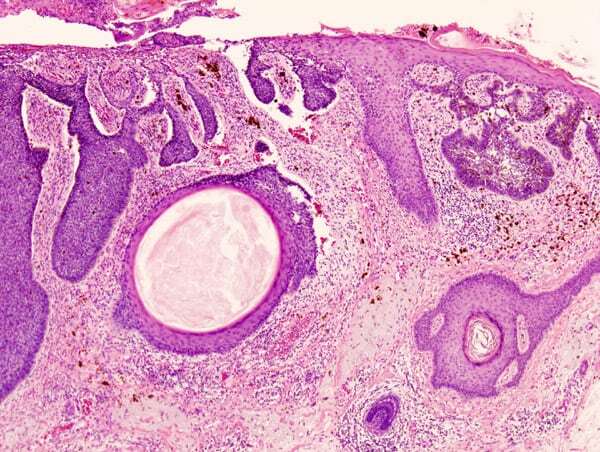 These tumors form in the outer layer of the skin, and appear as small bumps or sores. BCCs rarely spread beyond the original location of the cancer. Basal cell carcinoma is highly curable when discovered and treated in its early stages and almost never spreads to other areas of the body or becomes life-threatening. However, BCCs can be disfiguring and lead to dangerous complications if not treated promptly. In regards to cancer, “risks factors” are characteristics or traits that may make a person more likely to develop cancer. 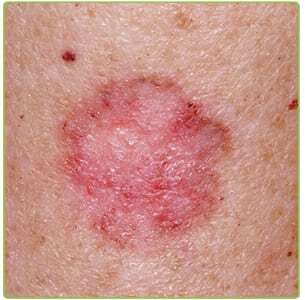 Many risk factors are associated with basal cell carcinoma, ranging from hair color and skin tone to family history. Generally performed on smaller lesions; lesions are scraped off with an instrument with a sharp, ring-shaped tip (a curette), and the tumor is burned. Radiation oncologists, such as those at SERO, utilize radiation therapy to completely eradicate the tumor over the course of several weeks of radiation treatments. Radiation is ideal for elderly patients or those who are not candidates for surgical excision. Liquid nitrogen is applied to the tumor tissue to freeze and destroy lesions. https://treatcancer.com/wp-content/uploads/2015/08/Basal_cell_carcinoma_histopathology_2.jpg 452 600 Southeast Radiation Oncology Group, P.A. https://treatcancer.com/wp-content/uploads/2015/08/SERO-logo-PNG-450x174.png 2015-08-03 18:56:482018-10-11 18:16:15What is Basal Cell Carcinoma? Survivorship Clinic – with Linda Coverdale – at CaroMont and Novant... What is Squamous Cell Carcinoma?